This old stone property is situated close to the Abbey and in walking distance of all . . . Interesting 3 bedroom property with a very reasonable price tag. Situated on a small quiet . . . Situated in a lovely little hamlet this detached property with an attached terraced area and . . . This stunning ensemble of properties with a 9acre stocked fishing lake, woodland, paddocks . . . Pretty two bedroom stone hamlet property with barn and garden, full of character and renovated in recent years. 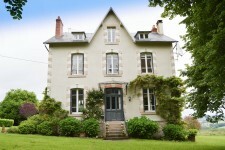 Situated in a very quiet tranquil corner of the Limousin, in an elevated position a few kms . . .